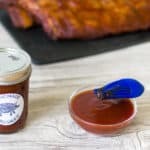 An easy sweet and spicy homemade BBQ sauce recipe that works well with all beef, pork, and chicken. You'll also want to print out these cute labels for your jars. These jars would make a great Father's Day gift! 2 tablespoons vinegar I like white vinegar with beef dishes and apple cider with pork and chicken. Simmer until reduced by about 25%, stirring frequently.